The drum-mounting system hooks around the drum’s tuning lug; the extended bolt allows the drum to be tuned while the mic is mounted. In the live-sound world, ‘gain before feedback’ is one of the most important factors in being able to get an instrument’s sound out of the PA speakers and into the ears of the audience, and while that’s rarely a problem with loud sources — like guitar amps and screaming vocalists — it certainly can be a real challenge with quieter acoustic instruments. 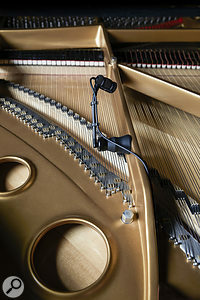 Often the only practical solution is to get a microphone as close as possible to the quiet sound source, but that then raises a raft of practical concerns, such as how to keep the mic in a stable position relative to the instrument, and if mounting on the instrument itself, how to avoid causing damage. From the aesthetic point of view, close miking inevitably also often tends to give an unbalanced tonality and an emphasis on the mechanical playing noises, simply because the mic is only ‘seeing’ a small portion of the instrument. While that can usually be remedied to an acceptable degree with some careful EQ and dynamics processing, such treatment only really works well if the microphone has a relatively neutral frequency response, such that it ‘takes EQ’ well. Of course, sometimes a close-miking approach is required not because the source is quiet, but because there are other loud sources nearby — such as a when miking a trumpet or sax, or a drum kit. In these situations, the emphasis is more on keeping the miking position consistent while also coping with very high SPLs. These are the kinds of challenges that Audio-Technica have sought to address with their elegant ATM350a instrument microphone system. This is available in six different packages, each intended for a specific type of instrument or application; all with the same microphone element but provided with different mounting hardware to suit the specific type of instrument. Each package is supplied in a hard case with a foam liner and mesh pocket to help store the various components tidily and safely. Currently, the instrument-mic packages include options for drums (ATM350D), piano (ATM350PL) and woodwind (ATM350W), as well as two universal clip-on sets with either short (ATM350U) or long (ATM350UL) goosenecks. (The piano model also has a long gooseneck, while all the others come with a short gooseneck). The sixth option is the ATM350UCW version, which is intended for direct connection to a wire transmitter — all the others come with a phantom-power connection module. Other than the lack of a phantom-power module, the UCW pack is identical to the short gooseneck universal set. There is also a range of additional mix-and-match accessories, including alternative screw-on capsule types. The microphone at the heart of this system is a relatively large, by modern standards, back-electret capsule measuring 12mm in diameter by 38mm in length, and weighing just 14.5g. Since self-noise is directly related to the diaphragm size, larger is definitely better when working with quieter instruments, but the capsule is still compact enough not to cause the player any problems when mounted on an instrument. Although the review samples were supplied with the standard UE-C cardioid-pattern capsules, alternative omni (UE-O) and hypercardioid (UE-H) capsules are also available as options, and replacing the capsule is a simple case of unscrewing the cap and screwing the alternative one in its place. After a nasty experience with the ultra-fine thread on an AKG C451 capsule back in the early 1980s, I still become a little anxious when replacing threaded capsules, but the way Audio-Technica have engineered their capsules for the ATM350a is rather clever, and there is negligible risk of cross-threading. The cardioid capsule’s maximum SPL is 159dB (for one percent THD at 1kHz), and the sensitivity is specified at 3.5mV/Pa — roughly in the same ballpark as a typical modern moving-coil stage mic. A soft and flexible 3.2mm-diameter cable exits the rear of the capsule, its length varying with the package. The P version for piano is four metres long, for example, while the UCW wireless clip-on model is only 1.4 metres. In all cases the cable is terminated in a four-pin Hirose HR10 plug, which is compatible with both Audio-Technica’s UniPak wireless transmitters and the dedicated AT8543 phantom-power module supplied with most AT350a packages. This phantom module measures 92 x 19 mm, weighs 90g, accepts any phantom voltage between 11 and 52 V, draws a very modest 3.5mA of current, and the audio output is presented on a standard three-pin XLR. Usefully, a recessed slide switch on the power supply’s body introduces a 12dB/octave high-pass filter turning over at 80Hz, which is very helpful for removing unwanted low-frequency noises. As previously mentioned, the gooseneck is available in two variants, the longer one (AT8490L) being about 24cm in length while the short one (AT8490) is around 14cm. A few cable clips are fixed to the gooseneck (two on the short one, and three for the longer version) to help dress the mic cable neatly, and they also help to minimise the passage of any mechanical vibration travelling along the cable into the capsule. At the mounting end of the gooseneck is a short hexagonal bar, again fixed at right-angles, which slips into an instrument-specific mounting base. Oddly, the bar can only be inserted into the various bases in one of the four cardinal angles, not the six 60-degree increments I expected given a hexagonal spigot. A strong magnet is used in the piano-miking variant.Looking at the AT8491U universal mount first, this comprises a spring-loaded crocodile clip made of metal but with rubber pads inside the jaws to protect the surfaces to which it is attached. The jaws open to around 10mm, but a surface thickness of about 8mm would be a more realistic maximum. This mount is primarily intended for use on things like the bells of trumpets, trombones, saxophones, and so on, although it obviously has many other applications, too. The gooseneck arm’s hexagonal spigot is secured into the croc-clip base with a metal knurled screw, and a second thumbscrew can be employed to exert additional jaw pressure to help lock the mount firmly in place. The gooseneck arm obviously allows the mic capsule to be positioned exactly as required, and is stiff enough to hold that position reliably. For piano applications the AT8491P mount comprises a circular rubberised base roughly 40mm in diameter and 60mm high, containing a strong rare-earth magnet. This allows the mount to be attached to a piano’s metal frame, or any metal object, and the top of the mount features a socket to receive the hexagonal spigot of a long gooseneck with a thumbscrew to clamp it in place. My favourite mount in the ATM350a system is the AT8491D variant for drums (shown above), which apparently has a patent pending. It’s an extremely elegant but slightly unusual design which sits directly on, and hooks around, one of the drum’s tuning lugs, with a spring-loaded clamp to grip the batter head’s rim from below. Using a tuning lug in this way ensures a really stable mounting position, which is great, but would — ordinarily — make tuning the drum impossible. Audio-Technica have got around that by incorporating a rotating bolt which extends the affected tuning lug upwards to retain its accessibility, making it possible still to fine-tune the drum’s tension even with the mic in place. 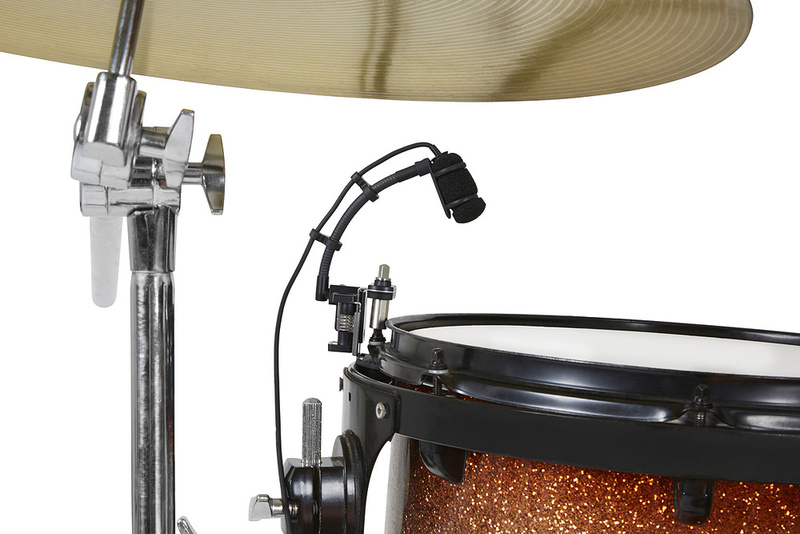 A short gooseneck clamps into the top of this ingenious mount allowing the mic capsule to be positioned as required over the edge of the batter head. 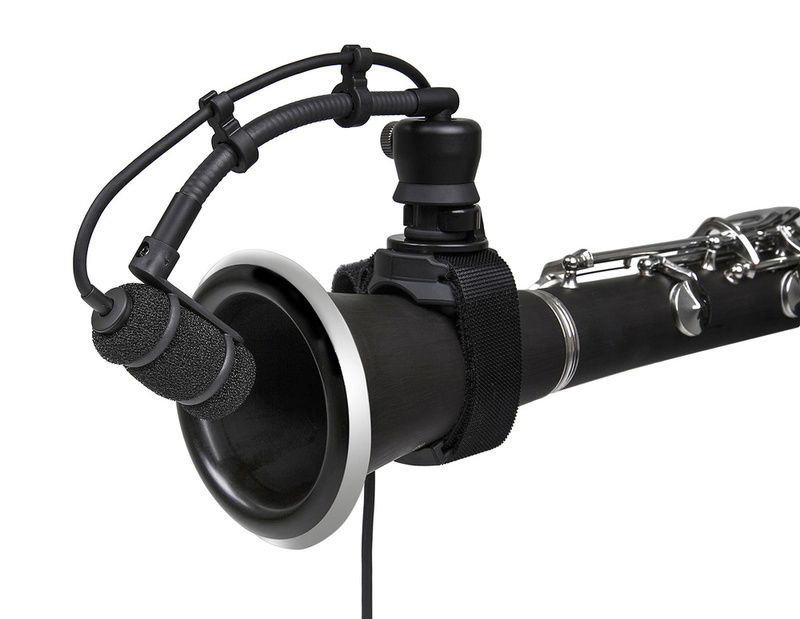 The woodwind mounting option, incorporating the short gooseneck.Woodwind instruments present an interesting mounting challenge for a microphone, not least because the universal crocodile type, which works so well on brass instruments, tends not to work on the much thicker woodwind flare. Audio-Technica’s solution is the AT8491W, which involves a rounded rubber base to sit on almost any tubular part of a clarinet, oboe or flute, for example, and it is secured with an adjustable Velcro strap incorporating a second curved rubber section to ensure a stable grip on the opposite side of the instrument’s tube. The top of this mounting base accepts the spigot of a short gooseneck secured with a thumbscrew again, and this top section can be rotated in 45-degree increments to allow the mic to be positioned to ‘look’ into the bell, or along the instrument’s shaft, making this a very versatile arrangement. Of all the different mounts, I found this woodwind variant one of the most fiddly to install, mainly because the Velcro strap had a habit of binding to itself while I was trying to adjust it. However, once properly fettled it provided a very stable and secure mount and afforded great flexibility in capsule positioning. The final mounting package option (AT8468) is designed for violins and other stringed instruments, and this one dispenses with the gooseneck altogether. Instead, the bare mic capsule is slipped into an elasticated loop of material stitched onto the back of a piece of Velcro, with a corresponding strip of Velcro stitched on to the assembly at one end. The idea is to place the mic capsule on the strings between the tail and bridge, pointing at the bow, sandwiching the strings between the two Velcro sections. Once fitted, the mic is held securely in place and isn’t in the player’s way at all, but this position does inherently capture a lot of bowing noise and relatively little of the instrument’s body sound, so it was the least successful of all of the system’s mounting options for me. 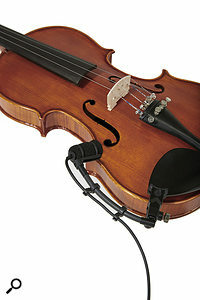 However, it is possible to use the gooseneck on violin instead, which places the mic near the instrument’s ‘f’ hole. There are two mounting options for violin — one in which the mic is attached to the bridge, and another using the gooseneck, which places the mic above the ‘f’ hole.For this review, I was supplied with one of each of the different mounting packages, one phantom-power module, and a pair of ATM350a mics with different cable lengths. Using these components I was able to experiment mounting them on a baby grand piano, a cello, a clarinet, a trumpet, and both a snare and tom. In all cases I found the hardware pretty easy to use and adjust, the mic stayed exactly where I put it, despite the concerted efforts of my not-so-tame musicians to shake them off, and nothing worked loose or rattled (provided care was taken with the cable dressing). The mounting variants with goosenecks were all very easy to position, and I didn’t notice any problems with unwanted low-frequency vibrations — although I did mostly keep the 80Hz filter switched on. 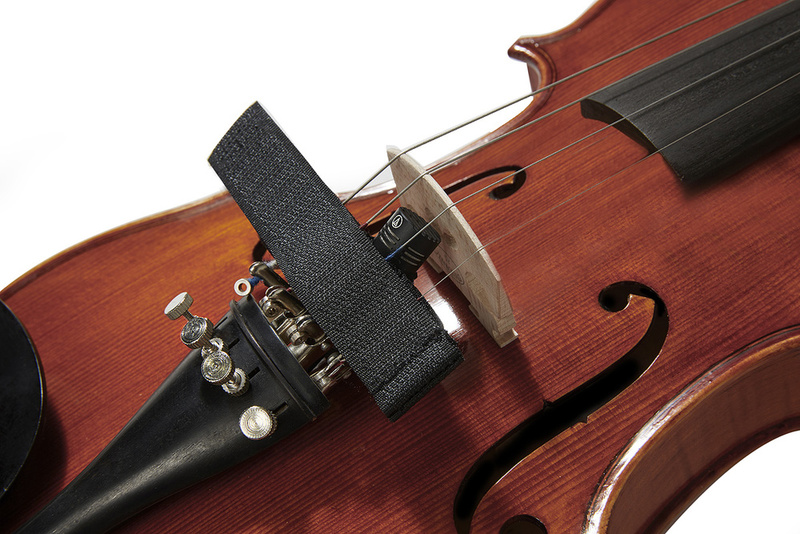 The only arrangement that I wasn’t 100-percent comfortable with was the violin bridge mount, and that wasn’t because of the mounting security — which was very good — but because of the inflexibility of the mic positioning. To be fair, I was able to get a perfectly reasonable sound from the cello using the AT8468 mount, and especially when I positioned it ‘upside down’ with the mic under the tail strings instead of above. More preferable would be the ability to position the mic above (or inside) one of the ‘f’ holes — a technique I’ve used very successfully before in live-sound situations — and the universal long gooseneck version does allow you to do this. In terms of sound quality, the ATM350a is quite a neutral and smooth-sounding mic, with a gentle roll-off above about 12kHz — a very appropriate feature for close-miking applications, in my view — and the low end is stepped down in level a little below about 300Hz, which counteracts the inevitable proximity effect nicely. Importantly, because of its fundamentally flat response, the ATM350a takes EQ very well, so although the direct sound might not win any tonality prizes from the purists, simply because of the ultra-close positioning this system enforces, it can be tweaked without too much trouble to sound most acceptable — certainly in the context of a live sound situation — and of course with minimal spill to ensure good levels of gain before feedback. Overall, the ATM350a, in all its various instrument-focused packs, is a well thought-out and cost-effective instrument miking system. The mounting hardware is well-engineered, sturdy and reliable, with good ranges of adjustment and secure fixings. While DPA undoubtedly sets the standards in this market, Audio-Technica’s more affordable offerings are definitely well worth consideration and give surprisingly little away in quality and versatility. DPA’s D:Vote instrument miking system is probably the closest competitor and clearly inspired much of the ATM350 system’s design. Not surprisingly, DPA’s offerings are considerably more expensive, but it also benefits from a greater and even more flexible range of mounting hardware. Neutral and smooth-sounding microphone which takes close-positioning well. Good range of very well-engineered and versatile mounting hardware. Not entirely comfortable with the mic position enforced by the AT8468 violin mount. A well-engineered and cost-effective instrument miking system with a good range of effective and reliable mounting hardware. ATM350U £316; ATM350UL £324; ATM350PL, ATM350W and ATM350D £333 each; ATM350UCW £224. Prices include VAT. ATM350U $299; ATM350UL $309; ATM350PL, ATM350W and ATM350D $349 each; ATM350uCW $199.